Jeremy Huggett is a Senior Lecturer in Archaeology at the University of Glasgow and has worked in computer applications in archaeology since 1984. His research interests are concerned with the social and philosophical implications of Information Technologies in archaeology, in particular the nature, development, impact and implications of information technologies in relation to the archaeological discipline and their effects on our understanding of the past. His research blog is at: https://introspectivedigitalarchaeology.wordpress.com/. Digital technology increasingly pervades all settings of archaeological practice and virtually every stage of knowledge production. Through the digital we create, develop, manage and share our disciplinary crown jewels. However, technology adoption and digital mediation has not been uniform across all settings or stages. This diversity might be celebrated as reflecting greater openness and multivocality in the discipline, but equally it can be argued that such diversity is unsustainable, and that standards are insufficiently rigorous. Regardless, all positions face the possibility of being severely tested by some large-scale external event: on every continent we witness economic and political upheaval, violence and social conflict. How is digitally mediated knowledge created, managed, and disseminated by archaeologists today, and how secure are the means by which this is achieved? To investigate this question we apply the futurity technique of scenario analysis to generate plausible scenarios and assess their strategic strengths and weaknesses. Based on this analysis we propose some measures to place archaeology in a more robust knowledgescape without stifling digitally creative disruption. This position paper concerns the direction of computer applications and the digital more generally within the discipline of archaeology, and the manner in which they are adopted and then affect our practices. Digital technologies are integral to many facets of current practice in archaeology. However, there is little evidence of disciplinary-wide coordinated programmes but clear indications of haphazard application adoption, fractures, and silos. The objective here is to develop a framework within which meaningful progress can be made towards a common strategic goal with regards to how we adopt technology and create, develop, manage and share our disciplinary knowledge, competencies and capabilities in the age of the digital. Strategic thinking necessitates negotiation with the future, a task fraught with risk. We can think of probable futures in which we extrapolate some existing trend, such as the adoption rate of a specific technology, or envisage the next generation of technology coming over the horizon (Burton & Barnes 2017). However, there are generally several possible, very plausible, alternative futures, in which case we may think in terms of a collectively preferred future and set a strategy which seeks to favour that outcome. In the real world such predictions can be completely undermined by a wildcard event, something thought so improbable, or even undreamt of, but having a massive positive or negative impact. External factors such as economic instability, political change, and technical disruption can have profound repercussions for the practice of archaeology: our disciplinary structures, principles and norms, and how our collective knowledge, competencies and capabilities are deployed, developed, and maintained or lost. This paper seeks to lay the groundwork for an executable disciplinary knowledge strategy that is both flexible and robust enough to withstand constant disruption as we move forward into an unstable, erratic, and uncertain future. In seeking to ground any observations about future developments in digital archaeology, it becomes apparent that present perspectives of digital archaeologists fall somewhere between two extremes. At one end, there is a broadly utopian view of digital archaeology as a transformative development, epitomised by Djindjian’s “ineluctable success” (2015), whereas on the other there is a more dystopian perspective that recognises the transformative aspect but questions whether archaeologists had much to do with it (e.g. Scollar 1999). Others prefer not to predict whether the impact will be positive or negative, but note they will undoubtedly have profound impact on practice and theory (Ucko 1992). “The history of archaeological computing is littered with the fallen causes of earlier utopian claims; the global databases of the 1970s, the potential of Artificial Intelligence in the 1980s, some of the claims for GIS in the 1990s.” (2003: 264). More dystopian (or at least, less utopian) perspectives can be seen in the way in which digital archaeology has been labelled as a borrower rather than a developer of computer-based methods for over forty years. For example, Whallon wrote of how archaeological computing was “in the stage of borrowing, experimenting, and adapting. Even the ‘newest’ methods … are all basically taken over from other fields within which they were developed” (1972: 41). Wilcock asked whether there was “a case of the Information Technology tail wagging the Archaeological dog, or are the new techniques so important that Archaeology must comply?” (1984: 30). Subsequently Richards (1998: 331) described current trends in computer usage as being as much technology-driven as theory-led, which he saw as regrettable. Similarly, Scollar (1999: 8) commented on the extent to which computer methods had gone in search of archaeological problems, placing archaeology in a ‘hand-me-down’ situation, while Lull (1999: 381) also noted that none of the technological tools used by archaeology were created by archaeologists. Indeed, the computer is frequently seen as being no more than a general-purpose tool, a view which carries connotations of neutrality, and consequently its implementation and use are seen as key rather than the socio-cultural or theoretical context within which it is applied or operated (Huggett 2000; Huggett 2004b). “If one asks, ‘Did computer methods make archaeological tasks known prior to computers easier, faster or cheaper’, the answer is probably ‘Yes’. If one asks, ‘Did computer methods reveal or lead to new archaeological knowledge’, the answer is probably ‘Rarely’” (1999: 8). “We are able to record information much more quickly in the field but to what degree is this “new information”? How much has it changed the way we conduct our analysis? We have the capacity to process and visualize information in novel ways but are we actually doing this? More importantly, are we even thinking about new possibilities? How do these new developments relate, if at all, with theoretical orientations currently found in archaeology? Has the introduction of information systems precipitated new ways of doing archaeology?” (2011: 217). As a consequence, he concludes that there is a need for a new technological focus in archaeology, and argues for the development of an Archaeological Information Science (AISc) (Llobera 2011: 218). “… we need a wake-up call that stirs us from our enraptured contemplation of speed, efficiency, accuracy, and three- or even four-dimensional digital surrogacy. We need to think … about what we are sacrificing along with what we are gaining from digital methods. We need to think about who is included and who is excluded by this changing practice. We need to think about why we do archaeology, and how our dependence on tools that are not necessarily made for our benefit constrains, as well as expands, our ability to look at the past. We need to think about the role that money and power play in shaping our relationship with digital approaches.” (Rabinowitz 2016: 498). the effect of relying on ‘borrowed’ tools and methods meaning archaeological computing is rarely seen as a donor or reference field (Huggett 2012: 16–17). Indeed, by way of agreement in what was otherwise a celebration of the success of archaeological computing, Djindjian identified three factors holding back the subject, arguing that computational archaeology “needs a proper name, a proper scientific review and a proper conference, well accepted and open to all specialists” (2015: 6). This anxiety discourse arose from frustration on three levels. First, digital technologies are transforming the practice of archaeology yet digital archaeologists are frequently seen as little more than technicians or technologists. Secondly, the significance of the transformation of archaeological practice by the digital was largely unrecognised or else taken for granted – archaeologists are simply consumers of the digital like everyone else and so powerless in the face of its inevitability. Thirdly, archaeologists were uncritically accepting of the new tools and opportunities that the digital offered. There is a sense of inevitability in this situation. Although computers have transformed the practice of archaeology in key respects, the fact that archaeological computing has been a follower rather than an innovator (see above) is a situation encouraged by the increased ubiquity of computer hardware and software which has meant that most archaeologists, in common with specialists in other disciplines and the broader (Western) world, increasingly rely on computers for their day-to-day work. Word processors, spreadsheets, graphics programs, and databases have become so embedded in general practice that today it can be legitimately claimed that all archaeologists are digital archaeologists to some extent (e.g. Morgan & Eve 2012: 523). At the same time, most computer applications in archaeology have become reliant on off-the-shelf software; as computers became more pervasive, fewer bespoke archaeological programs are required to meet the demands of the subject. Apart from highly specialised areas such as radiocarbon calibration and dendrochronology, most archaeological tasks can be undertaken using widely available commercial packages and, increasingly in recent years, free open source software. Even specialised tasks which used to be carried out by bespoke archaeological software such as air photograph rectification or processing geophysical survey data are now commonly undertaken using standard commercial or free packages. A consequence of this is that archaeological computing could be seen as essentially in a subordinate relationship with other disciplines such as information science, image processing, computer vision, and geographical science, with little novel development taking place within archaeology itself. Much digital archaeological research is therefore wholly or partly focussed on developing existing technologies from outside the field and applying them to serve archaeology. So with digital archaeology providing the technical underpinning of modern archaeological practice, can it play a more active role in knowledge creation and brokerage rather than just providing technological support? While archaeologists are increasingly digital, is there a place for a Digital Archaeology (and Digital Archaeologists) that challenges the theory and practice of the discipline, that has a transformative impact on the wider archaeological community by design rather than by incremental drift (Huggett 2015a: 84)? Or, at the other extreme, are archaeologists essentially powerless consumers of autonomous technologies, allowing the digital tools to shape the subject with little direct intervention (Huggett 2012: 204–5)? What are our ambitions for digital archaeology, if any? One means of approaching these questions was through the development of a series of disciplinary ‘grand challenges’ which sought to identify innovative digital tools and methodologies which could potentially not just be transformative for archaeology but also impact upon other academic fields and communities (Huggett 2013: 17–21; Huggett 2015a). The concept of pursuing innovation through the medium of grand challenges has seen several attempts in the general area of digital research in the UK and Europe (for examples, Huggett 2013: 18–19; Huggett 2015a: 81), as well as in non-digital areas. In archaeology, the best-known application is the American National Science Foundation-funded crowd-sourcing project Planning Archaeological Infrastructure for Integrative Science which developed 25 challenges surrounding cultural processes and human/natural systems, and concluded that these were underpinned by a digital challenge: the need for online access to documented primary research data (Kintigh et al. 2014; Kintigh et al. 2015). “The question should not be what the future of computing in archaeology will be, but what archaeologies may choose to do with computers in the future?” (2002: 589). Removing any connotation of technological determinism driving these challenges should help avoid the perception of computer archaeology as constituting little more than a technical support infrastructure (Llobera 2011: 217) and instead seeks to ensure that digital archaeology is a means of rethinking archaeology. The bar is deliberately set high while recognising that not all criteria need be met for a problem to be perceived as a ‘grand’ challenge (Huggett 2015a: 84–85). The initial challenge – to make the effort to develop grand challenges in the first place – was made in a plenary presentation at the Southampton CAA conference in 2012 (Huggett 2013). This was then taken up in a round table session at the Paris CAA 2014 conference entitled ‘What do you want from Digital Archaeology?’ (Huggett, Lock & Reilly 2014) which sought to take the first step in the debate. A series of invited speakers outlined their challenges in short presentations with associated discussion, foregrounding areas such as Open Data, knowledge extraction, digital curation, digital visualisation, textual GIS, the social web, formalisation of knowledge, and additive manufacturing. A number of these were subsequently developed for publication in Open Archaeology (Dallas 2015; Huggett 2015b; Jeffrey 2015; Kintigh 2015; Murrieta-Flores & Gregory 2015; Perry & Beale 2015; Reilly 2015; Watterson 2015). Emboldened, the task was resumed at the Siena CAA conference in 2015 at a round table session entitled ‘Challenging Digital Archaeology – the discussion continues’ (Reilly, Lock & Huggett 2015). This took a similar format as before, although with fewer presentations and a more focused and guided discussion, and challenges were identified in the cross-disciplinary areas of spatial and simulation analyses of urban evolution by Eleftheria Paliou, the development of digital ecosystems by Leif Isaksen, and knowledge representation by César Gonzáles-Pérez. Despite initial enthusiasm, there was little traction in terms of actually tackling the grand challenges which had been identified and critiqued. However, at the Siena conference a degree of common interest was identified between the ‘grand challenges’ theme and the concerns of the ARIADNE Special Interest Group on Archaeological Research Practices and Methods. This European Commission-funded project team was looking at integrating existing archaeological research data infrastructures and was seeking as part of this to develop perspectives on the future of archaeological digital practices in 2020–2025. An Expert Forum entitled ‘Digital futures of archaeological practice 2020–2025’ was held in Athens in July 2015 and provided an opportunity for the two groups to come together to share experiences and viewpoints. Here for the first time we deployed the futurist technique of ‘scenario-planning’ or ‘scenario analysis’ with the combined team as a means of investigating five key areas: virtual archaeology and 3D/immersive technologies; archaeological field recording; digital research infrastructures; legacy data; and open, community and participatory digital archaeology. A subsequent expert forum, ‘The future of archaeological knowledge curation 2021–2026’ in Athens in June 2016 built on the earlier discussions using a visioning and scenario-building methodology to anticipate the shape of future archaeological research infrastructures. The results of these ARIADNE SIG Expert Forums will be reported on elsewhere (Dallas et al. in prep.). The Oslo CAA conference in 2016 saw the most recent round table session, entitled ‘Unstable Futures/Potential Pasts: Scenarios for digital computing 2020’ (Lock et al. 2016). This sought to shift attention to the task of engaging with these challenges by asking the question “What are the plausible digital futures of our digital past and how might we prepare for them?” Participants developed a series of stories, or scenarios, in an attempt to ascertain credible future contexts in which digital technologies are likely to be introduced into archaeology, and, in particular, to address what could be done in order to address the implications and harness the insights drawn out of the scenario analyses. 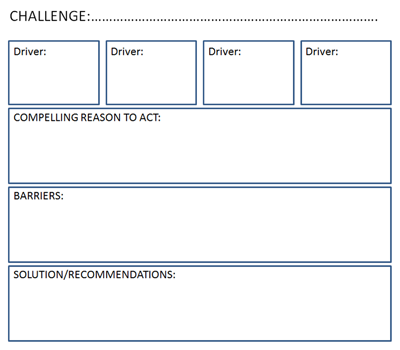 This was structured through the use of templates (Figure 1) which prompted participants to identify the key drivers behind a challenge, provide compelling reasons to act, ascertain the barriers to action, and suggest solutions or recommendations for moving forward. “we can truthfully say that it has never been more difficult to keep track of the diverse nature of archaeology let alone describe it effectively to non-specialists, and perhaps teach it to new students” (Sinclair 2016: section 1, para 4). The issue can be reduced to two key questions which are at the root of effective knowledge management. First, what must we do in order to know when we know something new? Without this fundamental capability there is little possibility of locating the so-called ‘something new’ and determining whether it is really valuable, or merely useful, or have the opportunity to critique, shape or incorporate that ‘new knowledge’ to the benefit of the broader community. Secondly, how do we identify gaps and obstacles to accessing our total potential pool of knowledge and capabilities (e.g. Beck & Neylon 2012: 480–481; Morris 2014)? Without the ability to recognise and identify such breaks and hurdles in knowledge and capability organisations will miss opportunities to improve, and risk wasting resources through reinvention and duplication. Clearly then, this bricolage of different institutional, private and individual knowledge bases makes it very difficult to see the gaps and to know ‘when we know something new’, whether it be new data, a discovery, a novel approach, an insight or finding and, especially, where, or with whom, this new or potential knowledge resides. This suggests the need for some level of knowledge brokerage. Knowledge brokers face an even greater challenge to determine what matters most, and how to negotiate, or otherwise gain, access to it, and, alongside the broader community, decide how best to organise, repurpose, augment and manage, share, promote, preserve and actively curate. Equally, knowledge brokers in conjunction with the community may also determine that some things are just noise and can be simply ignored. The ‘academic’ knowledgebase described by Sinclair (2016) is dwarfed by the prodigious quantities of grey literature and grey data produced annually by commercial archaeology (Kintigh 2015). Beyond the archaeological realm range the Open Data sources that provide data relevant to archaeology (for example, LiDAR tiles provided by the Environment Agency in the UK, and satellite imagery provided by Google, NASA and others). And then there are the products of the digital creativity of a plethora of individual user generated content (Beale & Reilly 2017a). For example, in 2010 the Council of British Archaeology identified some 2,030 voluntary groups involving 215,000 individuals involved in British archaeology alone (Thomas 2010). Combining this abundance of knowledge bases with the large number of academic, professional, public sector, and voluntary archaeological organisations, institutions and individuals around the world begins to reveal the scale of the challenge. These knowledge bases, knowledge creators, knowledge brokers, and knowledge users are vulnerable to the vagaries of less benign futures in which established practices and roles are disrupted when, for instance, the social, political and economic landscapes are fundamentally redrawn. For example, the aftershocks of subprime investments caused funding for British archaeology in all sectors to dry up (Aitchison 2010; Sinclair 2010) and the consequent loss of experience, knowledge and know-how. In the face of such challenges, trust and confidence in our knowledge economy are shaken and elements start to break down. A grand, but eminently pragmatic challenge starts to crystallise out: How do we build resilience, flexibility and agility into our organisations, our systems, our work practices and, especially, our precious knowledge bases? One way to address this question is to explore potential, or plausible, future knowledgescapes in order to develop a series of pragmatic strategic interventions. This approach – referred to as scenario-planning or scenario analysis – has been widely used by the military, government departments, large corporations and many other major organisations and institutions since the 1950s (see, for example, Bradfield et al. 2005; Wilkinson 2009). Briefly, strategic scenario analysts ask three fundamental questions in order to inform their organisational designs, development plans or, as here, disciplinary knowledge strategy. What could happen to the economic, social, political and other environments? What would be the impact on strategies, plans, budgets, policies, organisational structures, products, and knowledge? What needs to be done in order to be ready and able to respond effectively? Scenario planning is not predictive, and unlike traditional linear cause-and-effect forecasting in which the past impacts the present and in turn the future, time flows can be multidirectional and iterative and can reflect plausible futures from which we can learn. In effect scenario planning brings cultural depth. Its success or otherwise, in terms of producing provocative, productive and stimulating potential futures demanding action, depends on the identification of ‘critical uncertainties’: the possible effects of changes to the dominant forces that drive and shape the business environment, organisation, practices, outputs, and knowledge. For this analysis, the two critical uncertainties adopted to build the framework in which to situate the scenarios are the expanding spectrum of what we might describe as archaeological knowledge practices juxtaposed with the remorseless expansion of digital tools and technologies into every aspect of our lives (Figure 2). The time horizon is the not too distant future – some five to eight years. Both critical uncertainties are deliberately polarised to reveal the key dilemmas at stake for each of them. 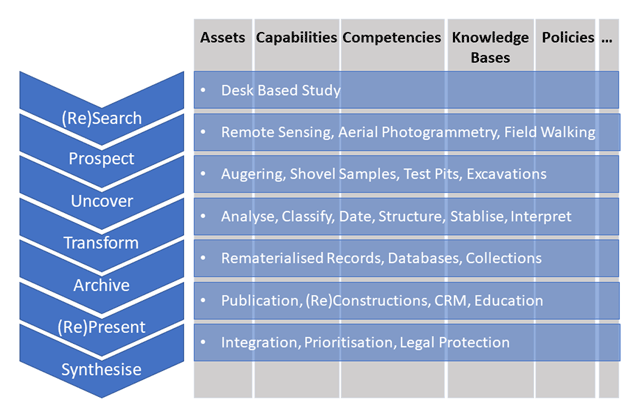 Digital Archaeology and Knowledge Practice scenarios framework. At one end of the axis of archaeological knowledge practice is located the heroic paradigm in which the accredited, professional specialist is securely employed in a substantial and established institution. At the opposite end of this axis is an environment of knowledge pluralism engendered by promiscuous crowds of independent knowledge workers operating under an open and overtly socially inclusive ethos. These knowledge workers are more or less unfettered by traditional career paths, have no ties to specific institutions, can ‘pick-and-mix’ professional or alternative norms, and are free to (indeed must) operate in a plethora of work situations and matrixed teams. This axis of critical uncertainty, which might be thought of as an axis of power concerning modes of enquiry and expression, exposes inherent tensions between established professional conventions of research and knowledge creation and new radically alternative approaches in a wider more social constituency, embodying a new politics of assemblage in the way knowledge workers gather around projects. The root question that this critical uncertainty provokes is what is the basis of knowledge authority? Further key subordinate questions of significance also arise, such as who decides the research agenda? ; what constitutes best practice? ; how should new knowledge be characterised, disseminated and curated, and by whom? The second axis consists of the technological dimension. At one end is the set of traditional, established (and frequently privileged) tried and tested tools, applications, techniques, and methods. At the far end of the axis is the exponential proliferation of novel, unmonitored, uncensored digital technologies and tools which are becoming ever more ubiquitous. The root question associated with this critical uncertainty is how are digital tools and technologies adopted in archaeology? Again, this provokes further ancillary questions such as how should they be assimilated? 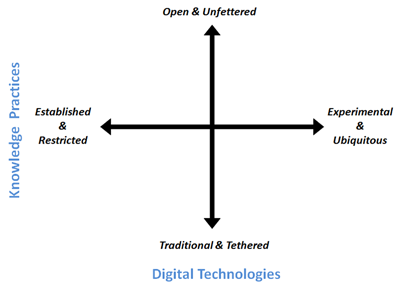 and who determines what digital tools are deployed, where, and by whom? Four radically distinct archaeological scenarios emerge from these spaces (Figure 3). For convenience, these are labelled the Ministry of Digital Orthodoxy, the Academy of Digital Advancement, the School of Digital Citizenship, and the Commune of Digital Anarchism. Although the assemblage of actors in each scenario overlaps considerably, their relative agency, their affordances and their weaknesses are exposed in the narratives that follow. Insights from all four scenarios will be used to inform and develop a new strategic approach. Digital Archaeology and Knowledge Practice scenarios. This scenario might also be referred to as “Digital Archaeologist-in-a-walled-garden”. This is a refined environment where a small cadre of professionally accredited archaeological specialists operate in a state-sponsored bubble, and perform a limited but robust portfolio of ‘best practice’ services using a standard set of prestige instruments (e.g. total station, laser scanner, digital camera, magnetometer, and so on). Within the Ministry career paths, titles, etc. are clearly defined and the work is equally predictable, following regularised workflows to produce standardised offerings (such as plans, images, and point clouds) ingested into a prescribed suite of packages and generating proforma excavation, survey or watching brief reports which are automatically deposited, registered and made available on-line in an approved and trusted digital archiving service. Although the Ministry has a strong web presence, it still strongly favours publication via monographs, books, journal articles, and interim reports (now available online as pdfs). This bureaucratic scenario exhibits the attractive properties of architected professional functions, workflows, software, and interfaces which support an ordered, predictable and reassuringly familiar and stable work environment. However, there are still doctrinal schisms which mean that there are slightly different flavours of digital archaeologist-in-a-walled-garden, each with their own capabilities and sectarian versions of the one true doctrine: public sector, commercial, academic, museum, and archival. Within the superficially simple and elegant walled garden of the Ministry of Orthodoxy there lurks a serpent whose name is ‘silo’. The knowledge landscape of the Academy of Digital Advancement is dominated by elite research-intensive higher education institutes, research laboratories and, in some areas, the industry expertise of multinationals delivered through corporate sponsorship. In this world archaeologists also have defined career paths, titles, and institutional attainment expectations (publication targets, performance reviews, etc.). Confident in their ability to secure a steady stream of adequate funding from a range of funding agencies and sponsors, institutions in this scenario can nurture and develop their knowledge-workers over a series of often overlapping or inter-connecting large-scale initiatives. Their corporate know-how, powerful institutional memory, and adherence to well-developed protocols facilitates close cooperation across culturally similar peer groups on complex multidisciplinary and internationally distributed projects. Should there be occasional interruptions in funding, these institutions are able to manage over the leaner times, retaining and continuing to develop experience, specialist expertise and knowledge. The Academy of Digital Advancement provides a fertile field for pushing technological developments, breaking down barriers, and opening large scale silos, thus creating knowledge beyond conventional interpretations. Normally, the Academy is reliably able to release significant new insights by leveraging the combined resources and expertise it commands to open up large and often intractable data sets. This might be achieved by applying expensive arrays of heavy-duty probes and instruments, depending on novel algorithms and powerful processors (for example, automatic feature extraction from massive streams of hyperspectral terrestrial, marine or satellite remote sensors (e.g. Bennett, Cowley & De Laet 2014; Comer & Harrower 2013). A popular approach is to integrate expensive infrastructure, such as national monuments databases, national museums, galleries, libraries, and other national archives and collections to create synergy by combining previously separated data (for example, Bernardou et al. 2017). From their inception such projects have prescribed deliverables, milestones, and standards of documentation and publication. They usually also have large international, multidisciplinary project teams who on the whole share a common knowledge culture and adhere to its norms. These collaborating institutions like to see themselves as helping to democratize data; however, non-members of these elite clubs may regard it as a form of knowledge colonialism and may not fully endorse these programmes, underlining that providing access to a robust, properly supported, open infrastructure does not guarantee engagement. Even with an elegant ontology, the knowledge base can be undermined by semantic drift and inadequate digital literacy in the general (potential) user community, and, of course, this presupposes that potential (re)user communities know what resources are available and how to discover and evaluate them in the first place. The School of Digital Citizenship offers an impressive, digitally enabled, Public Digital Archaeology prospectus, packed full of fascinating extramural courses and an extensive portfolio of outreach activities which appeal to a broad section of the socio-economic spectrum. A substantial part of the School’s success is due to its ability to cater for people from many different backgrounds and circumstances by allowing them to engage via a multitude of options, channels, and formats. This flexibility enables the School to offer considerable latitude in the levels of commitment required to participate in its programmes. Consequently this scenario places emphasis on the wide availability of largely compliant, interested and engaged, but avocational, anonymous and mostly unwaged crowds of auxiliary knowledge-workers. These are people who are prepared to altruistically give up their time and talents to be guided by, and to assist, experts in order to discover, uncover, reveal and share our national cultural patrimony and common heritage, ideally on a shared, open, and easy to use infrastructure to maximise the social benefit. In the process, the digital archaeologists behind the prospectus now have much greater freedom to fulfil a broader number of roles in the design, creation, and delivery of new digitally enabled vehicles which extend the range and the reach of archaeology. Many citizens prefer to keep their level of commitment casual, and dip in and out as it suits them and therefore typically perform simple repetitive task such as transcribing index cards for museum collections or tagging image content (e.g. Bollwerk 2015; Bonacchi et al. 2015). To facilitate such efforts, processes from orthodox workflows have been decomposed into simple-to-execute microtasks, defining a limited menu of discrete functions that can be applied to the individual records that are dispensed and assigned one at a time to participants by the system. Even quite complex tasks can be achieved with relatively little experience or background. Knowledge management in the School at this level is efficient in the sense that it is based on the application of explicit objectives and metrics, using well-defined, generally unambiguous and straightforward processes which are deployed repetitiously to extend or augment designated, established and stable digital repositories; inspired or ‘overseen’ by a small band of orthodox experts. New knowledge here tends to be incremental, accretive and is therefore easy to identify, incorporate and manage within the well-documented conventions of this factory-like knowledge-worker paradigm. The ‘expert’ archaeologist continues to maintain control, especially the release of updates (Beale 2012). However, in higher levels of the School of Digital Citizenship we find projects that offer far more scope for all involved to make a substantive contributions and receive recognition in the discipline or, equally, spawn new disruptive narratives outside the School. For example, Harris (2012) describes the disruption brought about by abundant low-cost location intelligent devices fostering the creation, transmission and augmentation of unofficial and unauthenticated volunteered geographic information and user generated content. Similarly, Maxwell (2017) describes the co-creation of digital models made possible through the availability and affordability of sophisticated digital scanners and cameras. In the process, consumer and producer roles are turned upside down (Harris 2012: 580), and as the barriers to ownership or access to technology fall, participants once trained in the use of the instruments and the workflow processes codified within these so-called cognitive artefacts (Huggett 2017), are empowered to be more flexible, experimental and (potentially) subversive agents, proactively and autonomously participating in digital archaeological research. As research projects and knowledge creation in digital archaeology escapes the School it goes viral. Mutations are spawned as unapproved versions. However, the School’s established knowledge management capabilities and quality controls are severely limited outside its virtually worn corridors and it is in these wild and public places that we encounter an undomesticated, dynamic archaeological community that has begun to unpack, transform, repackage and rethink digital technologies such as games and augmented reality in order to create and propagate new born-digital archaeologies (Beale & Reilly 2017b). We can no longer assume that novel digital archaeology applications, research and their associated knowledge and new capabilities will emanate exclusively from the Ministry of Digital Orthodoxy or the Academy of Digital Advancement. In the Commune of Digital Anarchism the disciplines and practices of archaeology – and consequently digital archaeology – have been completely liberalised and deregulated. The formerly distinct and isolated parallel universes of (alternative) academic, commercial, state-sponsored, public, indigenous and other vernacular digital archaeologies and distinctive networks of archaeological communities have collided and now extensively interpenetrate one another. Former hierarchies have become heterarchies. The practices of archaeology have become a highly fragmented, hyper-dimensional ecology of freestanding, time-bracketed projects populated by transient matrixed teams of self-employed (digital) archaeologists who make their living by moving from one project to another, nearly always on short contracts. Project life is a series of shifting melting-pots involving serial postdoctoral research fellows, para-academics or ‘alt-acs’ (Rolfe 2014; Kansa & Kansa 2015; Kansa 2016), part-time curators and librarians, sometime temporary adjunct lecturers, job-sharing programmers, team leaders, peripatetic project managers and field workers, contract geoscientists, supply finds officers and a plethora of other consulting specialists, amongst others. Knowledge-work is totally decentralised. Yet to survive, let alone thrive, the digital archaeology knowledge-workers confronted with this dynamic environment need access to all necessary knowledge bases relevant to the unique requirements of each new project. Their response is anarchy. Anarchy can be viewed in two diverging ways: as the philosophical tradition of heterogeneous order (Fajardo & Rotermund 2017; Borck & Sanger 2017), or as the negative stereotype of unordered chaos. Either or both is possible. In the first type of anarchy, unfettered by institutional affiliations, knowledge workers embrace an anarchist philosophy of mutual recognition, self-governed order and an ethos of cooperation, openness and sharing. The knowledgescape of the Commune supports a broad plurality of views as new projects and creative discourse is no longer dominated by research councils and a relatively few elite institutions. Gradually the legacy knowledge bases have been unpacked and repackaged and integrated using open formats on open platforms as special interest groups and special communities of practice spontaneously assemble to augment their specialist knowledge and share their practices. Personal digital archives are shared, backed up and developed within and across these communities of knowledge. They become de facto publications. Acclaim, reputation and knowledge follow the journeys of individual digital archaeologists and thus is distributed across a matrix of projects, formal and otherwise. Pop-up symposia, unconferences, maker spaces, and other alternative loci of knowledge creation enliven the ebb and flow of critical discourse. Publication is also redefined and whole new categories of knowledge contributions and outputs developed that are equally recognised across the discipline. Credit is given for placing code and data into cloud-based open vaults, and for their ongoing re-use, and alternative metrics (Konkiel 2016) such as trending on social media. Reimagine this scenario steeped in the negative stereotype of anarchy as the rejection of authority and control systems, fostering a climate of subversion and discordance leading to disorder and turmoil. With this dystopian cast, there is no effective, overarching or unifying knowledge model, and no practices or conventions that allow the products of these different archaeological tribes to be brokered, brought together, and synergised. The opposite situation prevails: deregulation advocates pluralism and creativity across the broad, but economic austerity precipitates contraction and a tendency to minimise costs, including the bare minimum for compliance or conformity. As most archaeologists are no longer aligned with any particular practice (i.e. state, commercial, academic, or public) they are described euphemistically as ‘independent’ archaeologists. This growing digitally mediated online tribe (O’Neil 2009; Richardson & Lindgren 2017) does not have the backing of, or concomitant obligations to, corporate resources and their associated financing of policies. The archaeological knowledgescape is therefore fragmenting: outside the shrinking national cultural and memory institutions and organisations, independent archaeologists are accumulating discrete and unique knowledge, practices, and personal digital archives, and have little incentive to expend their earnings making available their unique knowledge and source of employment. With unknown provenance and variable backup facilities, only a fraction of this distributed knowledge will be deposited in Ministry, Academy or School knowledge bases, risking yet another ‘Digital Dark Age’ (Jeffrey 2012). In short, this scenario demonstrates that without clear cross-industry knowledge-practice norms the safe-keeping of the bulk of contemporary archaeological knowledge and data becomes precarious, a situation in which our disciplinary ‘crown jewels’ become very fragile and vulnerable to destabilising and destructive external factors. Various combinations of elements of these four scenarios are already recognisable within current national archaeology and cultural heritage. For example, in more deregulated countries such as the UK, USA, and Canada, elements of all four scenarios co-exist, whereas in countries with strong state-controlled cultural and memory institutions (for instance, Belgium, Germany, and Greece) a Ministry of Digital Orthodoxy together with an Academy of Digital Advancement are the primary drivers. However, the four defined scenarios are not mutually exclusive, although they were deliberately polarised to foreground their strengths and weaknesses. Indeed, they share several fundamental interdependencies: for instance, their roots are typically derived from an existing knowledge base, itself a legacy system such as a National Sites and Monuments register or some other Galleries, Libraries, Archives or Museums database developed under the auspices of the Ministry. Similarly, citizen projects can draw on formerly closed or restricted Ministry archives which have been opened, perhaps enriched, linked, and made publicly available through the collaboration and open infrastructure supported by the Academy. Empowered citizen knowledge workers may participate in a broader range of increasingly sophisticated digitally mediated archaeological knowledge practices across several separate or distinct archaeological communities. These attributes of transferable and interoperable knowledge practices are still more pronounced in the Commune which also utilise and supplement Ministry, School and Academy knowledge bases and practices. Scenario analyses are useful for exposing fundamental flaws and strategic weaknesses in practices and programmes, especially where they are likely to be confronted by rapid and major disruptions such as those caused by economic and political upheavals. Indeed, we have already experienced a number of such disruptions impacting on digital archaeological knowledge practices. For instance, we can point to the catastrophic impact of the 2007 economic crisis on commercial and public sector archaeology, and the loss of many thousands of archaeological professionals and their knowledge and know how. More recently, in 2017 the Trump administration’s attack on the National Endowment to the Humanities in the USA, and the impact of Brexit on British universities (Nielsen et al. 2017) as well as archaeological funding more generally (Schlanger 2017). In the face of such external disruptions, scenarios such as these become invaluable as a means of understanding the interdependencies, disconnections, and fractures which are a consequence of the different fiefdoms, ideologies, and uncoordinated knowledge bases. For example, a key strength of the Ministry and the Academy lies in their well-documented archives, reports and databases which have been more or less continuously accumulated, normalised and maintained over many years. However, the “traditional, formal, mediated and permanently recorded modes of discourse” (Jeffrey 2012: 560) of archaeological archives were established generations ago when the chain, the plane table, the pencil and plan and section (2D drawing), and later photographs, were the tools of the archaeological officers of the day. A proportion of the work is published but the vast majority is housed in institutional archives, so-called walled gardens (e.g. university, national, regional and local collections). Jeffrey (2012: 557) succinctly sums it up: “we are now entering a very different world from where digital technologies are simply used to replicate the work flows and practices of the analogue age, and new archiving issues arise.” Modern digital technology allows much more freedom, flexibility and sophistication but nevertheless many of these legacy forms of representation still underpin much archaeological practice, albeit carried out much faster and digitally augmented. These technologies also allow potentially greater access, assuming familiarity with the knowledge conventions and access technologies. At the same time, unavoidable legacy technologies give rise to silos, mediating and providing access to their own walled gardens, and requiring some guidance on how to negotiate between them. By way of comparison, the Commune of Digital Anarchy scenario is arguably the richest in terms of exposing the flaws, weaknesses, and the potential strengths of contemporary archaeological knowledge practice. Indeed, in many ways it is not just a plausible future: it represents the emerging future. 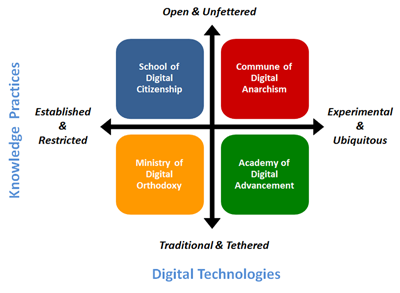 As an enveloping scenario engulfing the other three with their own distinctive and largely disconnected knowledge practices and resources, it needs to take the best of what has already been established in the Ministry of Digital Orthodoxy, Academy of Digital Advancement, and the School of Digital Citizenship, and build new bridges between the different silos and their experts and alternative viewpoints. At the moment, we cannot see the whole for the walled gardens. Archaeology is a global humanities discipline operating within the Information Age. Now digitally connectable, how do/should we connect it all together? At what level? Or, to rephrase the question, what should the discipline of archaeology as an international knowledge enterprise look like in the digital age? The present authors cannot, and should not attempt to, answer that question alone. The establishment and development of global disciplinary knowledge best practices represents a disciplinary grand challenge, and as we have stressed already, grand challenges demand collaborative rather than individual enterprise (see Huggett 2012: 22). Unsurprisingly, what the experience of pursuing grand challenges in recent years has emphasised is that by their very nature they are not easy to get to grips with. They are difficult to identify clearly and it is very difficult to propose ways of progressing them, let alone execute them. Here we diverge from Costopoulos (2016) who has argued that there is too great a focus on debating digital approaches and tools as objects of study and there is a greater need to emphasise practical applications of these digital tools within archaeology. There remains a need for intellectual engagement, while recognising too much introspective debate can become self-defeating (Huggett 2015b: 89). At some point introspection has to be turned into outrospection. At a simple level, outrospection can simply be a matter of discussing the results of introspection, but to be really useful, outrospection needs to consist of action, somewhat akin to Costopoulos’s “building a digital archaeology by doing archaeology digitally” (2016: 2). Accordingly, we offer a provisional template for a roadmap which we invite the broader community to embrace, re(de)fine, and develop since there are many types of mapping and filtering which can be explored (Figure 4). The grand disciplinary challenge we therefore issue is to produce an end-to-end digital archaeology knowledge map. The CAA organisation, as a unique pan-archaeology digitally-focussed forum, provides a means by which we might add value by catalysing a dialogue to generate a high level model of the digitally-enabled archaeological knowledge practices and capabilities and start the process of mapping our assets, resources, best practices, and gaps. We merely sketch the faint outlines of what this map (or more likely maps) should look like. We submit that such a common disciplinary objective must be a community-driven map that subsumes existing specialised walled garden representations. It should be relevant and recognisable (if necessary reconfigurable for different user groups) across the discipline, addressing the totality of our assets: processes; methods, tools and applications; data and reports (grey included); collections; and our communities, interest groups, experts and other keepers of knowledge. Any gaps and contentions within the knowledge map should also be rendered explicitly. High-level illustrative template for an end-to-end Disciplinary Knowledge Map. As an outcome of this process, we propose the development of a high-level digital disciplinary architecture – a consensus model of what archaeology does as a whole – from which the community can derive other maps such as functional and application architectures, process maps, capability/competency mapping and so on. Equipped with these models the community can begin exposing assets and resources (i.e. explicit and tacit knowledge), harvesting best in class, identifying gaps or deficiencies, providing access and gateways, and documenting issues and opportunities where community efforts might be productively focussed. In a disruptive world order, we need to build agility and resilience into our practices, competencies and capabilities. Mapping our resources and gaps is only the first step in this process. None of this would have been possible without the involvement of a large number of individuals, contributors and audiences at the series of round tables. In particular, we would like to thank the contributors to the Paris, Siena and Oslo round tables: Juan Barceló, Gareth Beale, Nicole Beale, Agiatis Bernardou, Hugh Corley, Costis Dallas, César Gonzáles-Pérez, Ian Gregory, Leif Isaksen, Stuart Jeffrey, Keith Kintigh, Patricia Murrieta-Flores, Eleftheria Paliou, Sara Perry, Sebastian Rahtz, and Alice Watterson. The ARIADNE SIG Expert Forums in 2015 and 2016 were organised by Costis Dallas, Agiatis Bernardou and the Digital Curation Unit-IMIS, Athena Research Centre and the Faculty of Information (iSchool), University of Toronto. Most recently Reilly shared an earlier version of these scenarios with participants at CAA-UK 2017. We thank all for their generous feedback. This article is based upon work from COST Action ARKWORK, supported by COST (European Cooperation in Science and Technology). www.cost.eu. Aitchison, K. 2010. United Kingdom archaeology in economic crisis. In: Schlanger, N and Aitchison, K (eds. ), Archaeology and the Global Crisis: Multiple Impacts, Possible Solutions, 25–29. Tervuren, Belgium: Culture Lab Editions. Beck, A and Neylon, C. 2012. A vision for open archaeology. World Archaeology, 44(4): 479–497. Bernardou, A, Champion, E, Dallas, C and Hughes, L. 2017. Introduction: a critique of digital practices and research infrastructures. In: Bernardou, A, Champion, E, Dallas, C and Hughes, L (eds. ), Cultural Heritage Infrastructures in the Digital Humanities, 1–14. Abingdon: Routledge. Boast, R. 2002. Computing Futures: A Vision of the Past. In: Cunliffe, B, Davies, W and Renfrew, C (eds. ), Archaeology: the widening debate, 567–592. London: British Academy. Borck, L and Sanger, MC. 2017. Introduction to Anarchism in Archaeology. SAA Archaeological Record, 17(1): 9–16. Burton, B and Barnes, H. 2017. 2017 Hype Cycles Highlight Enterprise and Ecosystem Digital Disruptions: A Gartner Trend Insight Report. Stamford, CT: Gartner Inc.
Djindjian, F. 2015. Computers and Mathematics in Archaeology, Anatomy of an Ineluctable Success! In: Giligny, F, Djindjian, F, Costa, L, Moscati, P and Robert, S (eds. ), CAA2014. 21st Century Archaeology. Concepts, methods and tools. Proceedings of the 42nd Annual Conference on Computer Applications and Quantitative Methods in Archaeology, 1–6. Oxford: Archaeopress. Fajardo, JA and Rotermund, SM. 2017. Anarchy and Archaeology: Toward a Decentralization of Knowledge. SAA Archaeological Record, 17(1): 37–38. Huggett, J. 2000. Computers and archaeological culture change. In: Lock, G and Brown, K (eds. ), On the Theory and Practice of Archaeological Computing, 51: 5–22. Oxford: Oxford University Committee for Archaeology Monograph. Huggett, J. 2004b. Archaeology and the new technological fetishism. Archeologia e Calcolatori, 15: 81–92. Huggett, J. 2012. What lies beneath: lifting the lid on archaeological computing. In: Chrysanthi, A, Murrieta Flores, P and Papadopoulos, C (eds. ), Thinking Beyond the Tool: Archaeological Computing and the Interpretative Process, 204–214. Oxford: Archaeopress. Huggett, J. 2013. Disciplinary issues: challenging the research and practice of computer applications in archaeology. In: Earl, G, Sly, T, Chrysanthi, A, Murrieta-Flores, P, Papadopoulos, C, Romanowska, I and Wheatley, D (eds. ), Archaeology in the Digital Era, 13–24. Amsterdam: Amsterdam University Press. Huggett, J, Lock, G and Reilly, P. 2014. What do you want from Digital Archaeology? Round Table session, CAA, Paris. http://caa2014.sciencesconf.org/resource/page/id/30#R1 [Last accessed 29 October 2017]. Kansa, EC. 2016. Click Here to Save the Past. In: Averett, EA, Gordon, JM and Counts, DB (eds. ), Mobilizing the Past for a Digital Future: The Potential of Digital Archaeology, 443–472. Grand Forks, ND: The Digital Press at the University of North Dakota. Konkiel, S. 2016. Altmetrics for the humanities: Disciplines, output types, and discovery. https://www.altmetric.com/blog/altmetrics-humanities-figshare-study/ [Last accessed 29 October 2017]. Laflin, S. 1999. Twenty Five Years of Computer Applications in Archaeology. In: Dingwall, L, Exon, S, Gaffney, V, Laflin, S and van Leusen, M (eds. ), Archaeology in the Age of the Internet. CAA97. Computer Applications and Quantitative Methods in Archaeology, 3–4. Oxford: Archaeopress. Lock, G. 2003. Using Computers in Archaeology: towards virtual pasts. London: Routledge. Lock, G, Bernardou, A, Dallas, C, Reilly, P and Huggett, J. 2016. Unstable futures/Potential pasts: scenarios for digital computing 2020. Round Table session, CAA, Oslo. http://ocs.caaconference.org/index.php?conference=caa&schedConf=caa2016&page=paper&op=view&path%5B%5D=1767 [Last accessed 29 October 2017]. Lull, V. 1999. The New Technologies and Designer Archaeology. In: Barceló, JA, Briz, I and Vila, A (eds. ), New Techniques for Old Times. CAA98. Computer Applications and Quantitative Methods in Archaeology, 379–383. Oxford: Archaeopress. Morris, E. 2014. The Certainty of Donald Rumsfeld. The New York Times, 25th March 2014. https://opinionator.blogs.nytimes.com/2014/03/25/the-certainty-of-donald-rumsfeld-part-1/ [Last accessed 29 October 2017]. Nielsen, K, Farla, K, Rosemberg Montes, K, Simmonds, P and Wain, M. 2017. The role of EU funding in UK research and innovation. London: Technopolis. https://royalsociety.org/topics-policy/publications/2017/role-of-EU-funding-in-UK-research-and-innovation/ [Last accessed 29 October 2017]. O’Neil, M. 2009. Cyberchiefs: Autonomy and Authority in Online Tribes. London: Pluto Press. Rabinowitz, A. 2016. Mobilizing (Ourselves) for a Critical Digital Archaeology. In: Averett, EA, Gordon, JM and Counts, DB (eds. ), Mobilizing the Past for a Digital Future: The Potential of Digital Archaeology, 493–520. Grand Forks, ND: The Digital Press at the University of North Dakota. Reilly, P, Lock, G and Huggett, J. 2015. Challenging Digital Archaeology – the discussion continues. Round Table session, CAA Siena. http://2015.caaconference.org/program/roundtables/rt1/ [Last accessed 29 October 2017]. Rolfe, G. 2014. We are all Para-Academics Now. In: Wardrop, A and Withers, D (eds. ), The Para-Academic Handbook: A Toolkit for Making-Learning-Creating-Acting, 1–5. Bristol: HammerOn Press. Scollar, I. 1999. 25 Years of Computer Applications in Archaeology. In: Dingwall, L, Exon, S, Gaffney, V, Laflin, S and van Leusen, M (eds. ), Archaeology in the Age of the Internet. CAA97. Computer Applications and Quantitative Methods in Archaeology, 5–10. Oxford: Archaeopress. Sinclair, A. 2010. The end of a golden age? The impending effects of the economic crisis on archaeology in higher education in the UK. In: Schlanger, N and Aitchison, J (eds. ), Archaeology and the Global Crisis: Multiple Impacts, Possible Solutions, 31–44. Tervuren: Culture Lab Editions. Thomas, S. 2010. Community Archaeology in the UK: Recent Findings. York: Council for British Archaeology. Ucko, P. 1992. Foreword. In: Reilly, P and Rahtz, S (eds. ), Archaeology and the Information Age: A Global Perspective, vii–ix. London: Routledge. Wilcock, J. 1984. A Brief Introduction to the Technology of ‘IT’. In: Martlew, R (ed. ), Information Systems in Archaeology, 21–30. Gloucester: Alan Sutton. Wilkinson, A. 2009. Scenario Practices: In Search of Theory. Journal of Futures Studies, 13(3): 107–114. http://jfsdigital.org/articles-and-essays/2009-2/vol-13-no-3-february/scenario-symposium/scenarios-practices-in-search-of-theory/ [Last accessed 29 October 2017].